Our product range includes a wide range of electrical plaster cutting machine. We are counted among quality devoted entities affianced in providing excellent quality Electrical Plaster Cutting Machine. This machine is specially used for efficient and hassle-free cutting of plaster that is used in bone surgery. 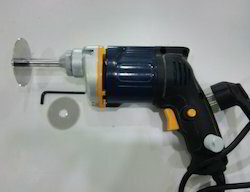 Our dexterous professionals manufacture this machine by utilizing the best grade components and sophisticated techniques. Apart from this, our patrons can easily purchase this machine in several technical specifications at the most affordable rates from us.